Note: All food and beverages were complimentary. 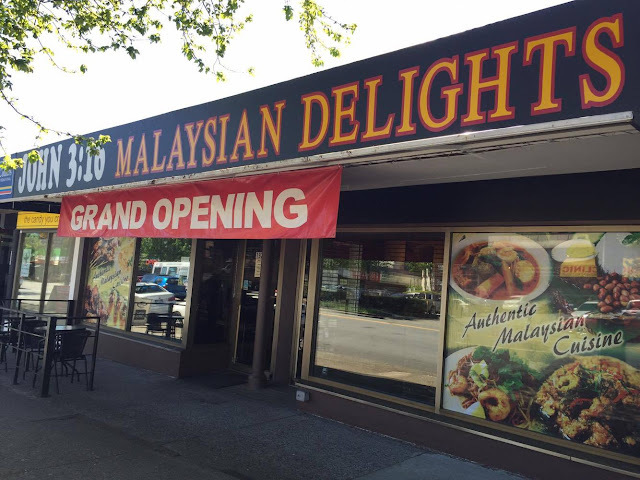 John 3:16 Malaysian Delights was a hidden gem in Richmond, so when the complex they were located in sold to developers, all the stores in the strip mall had to close down. John 3:16 then opened up a restaurant in North Van and Sharon invited me along with some other food bloggers to get a media tasting of their menu. The location is far for me, but the good news is they have secured a new spot in Richmond and will re-open this summer! 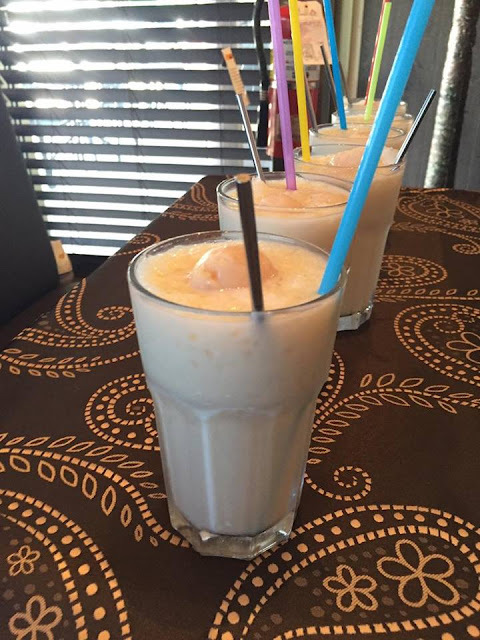 First up was one of their new drinks – Iced Lychee Soya Milk. 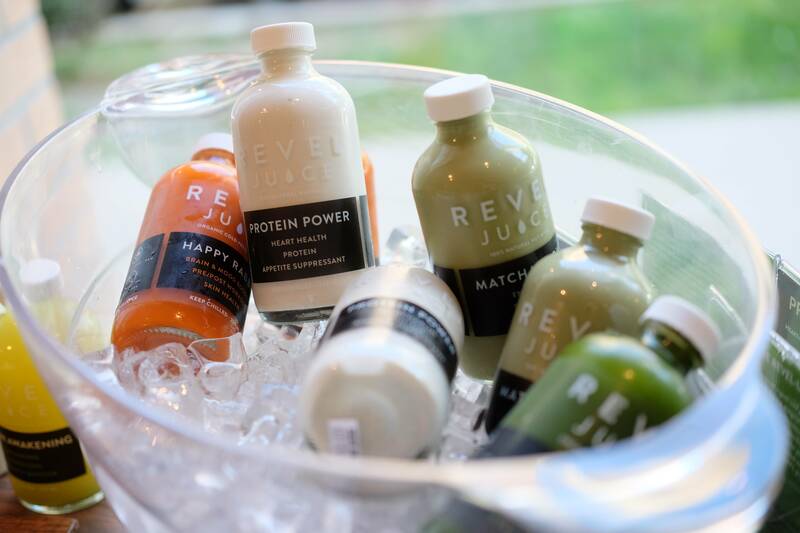 If you like soya milk, this is for you. However, I felt bloated after drinking too much of this and the lychee juice is not strong enough. I ended up eating the lychees themselves to get more flavour. G ordered the Iced Lychee Juice which she found to be a better option. 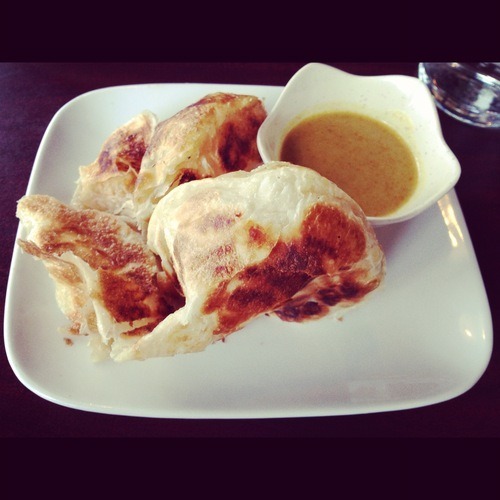 My favourite appetizer from John 3:16 arrived and these Roti Canai have got to be one of the most flaky roti I’ve had. 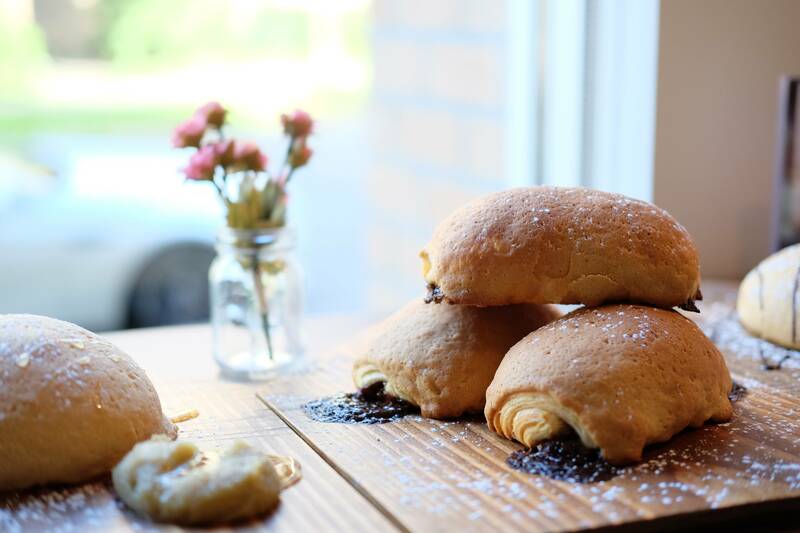 Warm and flaky, with a nice crunch on the outside but still soft on the inside. This was paired with a side of curry which was light and mild in spice. The Chicken Skewers were marinated in a sweet savoury sauce and cooked to a nice char. The meat was tender and moist and I enjoyed dipping it in the side of peanut sauce. The last time I had Pulut Panggang was when I was at a hawker centre in Singapore. The rice is wrapped in banana leaf giving it a fragrant flavour and is cooked to more of a chewy texture. 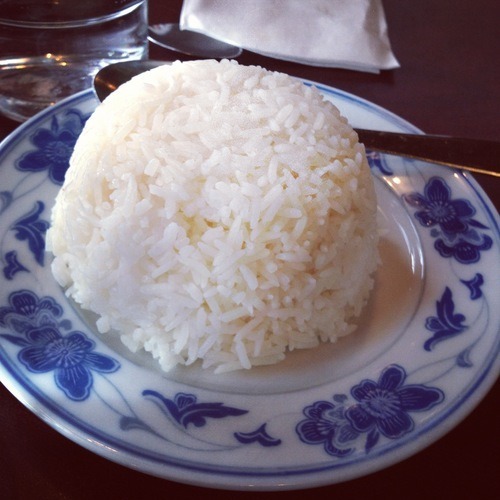 The rice is filled with a sweet coconut filling which I really enjoyed. Onto some hot food was the Malay Spicy Seafood Soup. At first, we wondered if we should be dipping something into this, but the more we drank it, the more we enjoyed it. Turns out, it is actually a soup so we were doing the right thing! 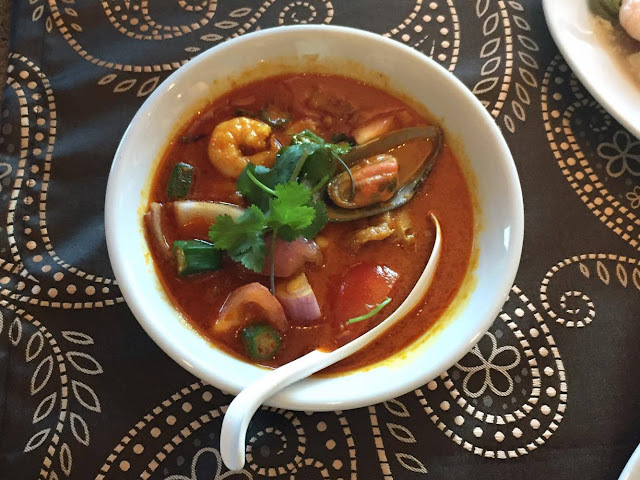 An abundance of seafood is cooked with vegetable, Malay spices and coconut milk to create this aromatic soup. Not overly spicy, but more of a sweet undertone from the seafood with a slight tang. 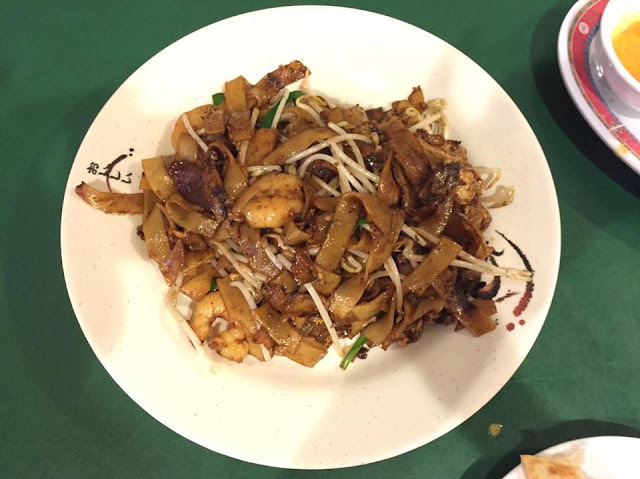 The Char Koay Teow was an item I had tried previously at the Richmond location, and once again, this did not disappoint. The stir fried flat rice noodle was mixed with beef, shrimp, egg, bean sprouts, Chinese sausage and fish cake. I like how it had “wok hay” and was not overly greasy, which is often the case for this dish. 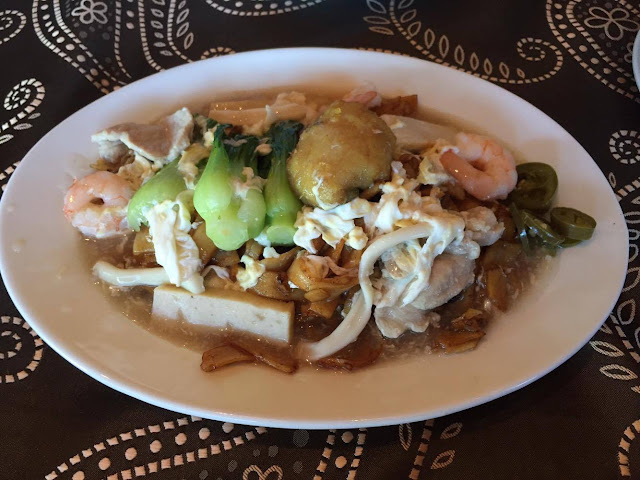 Next was the Ipoh Char Hor Fun, which is stir fried flat rice noodle with fish, shrimp, fish cake and vegetable. This comes in a light egg-starch gravy, and I found the flavours to be rather mild. This was just average for me. 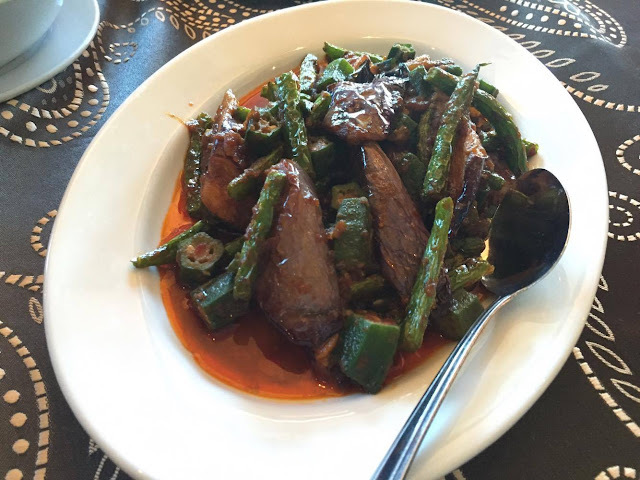 Of course we had to have some veggies, so we sampled the Sambal Okra, Green Beans & Eggplants. This was in a spicy sauce with the eggplants being cooked to a nice texture (not over cooked). Onto more noodles, we had the Kari Laksa, which featured egg noodle in curry soup served with curry chicken, tofu puffs, green beans, egg, fish cakes, shrimp and bean sprouts. Rich in coconut flavours with a nice spice. I found that most of their items are not too spicy in general. 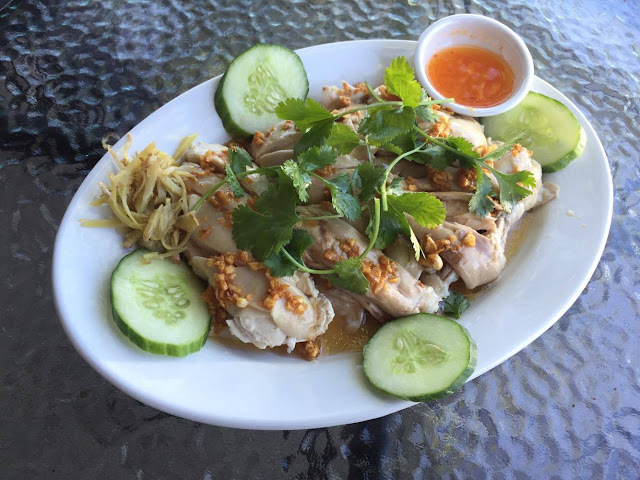 The Hainanese Chicken is a winner for me with the tender boiled boneless chicken being served with a special sauce, ginger, cucumber slices and chili sauce. I like how they top it with fried garlic so it gives a nice flavour. 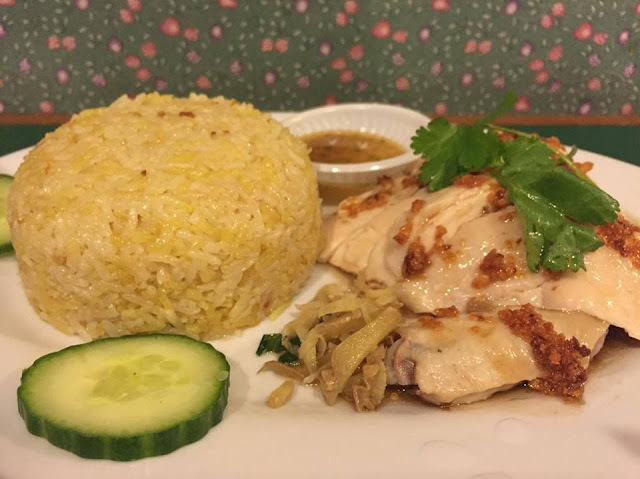 Extremely tender and moist chicken! Another one of my favourites was the Kam Hiong Prawns. These prawns are huge but they kept a great bouncy texture without being overcooked. The sauce is absolutely delicious as it is sweet with a hint of spice. 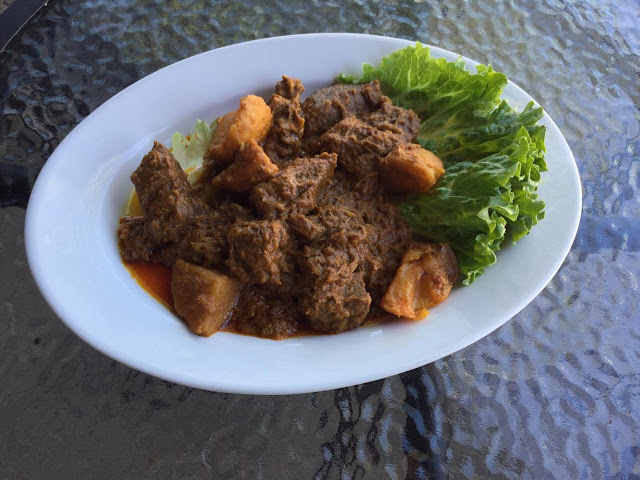 The Beef Rendang is a dried curry beef stew cooked with Malaysian spices and coconut milk. I thought these looked quite dry, but they were actually quite moist! This would be great paired with rice. 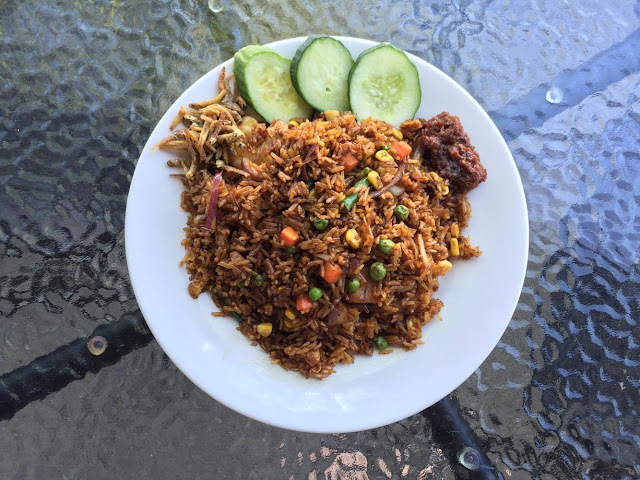 Last but not least, another favourite was the Nasi Goreng. This stir fried rice came with egg, shrimp, squid, corn, carrot, green peas and was served with cucumber slices, anchovies and sambal on the side. I liked how the sambal was put on the side so you can determine how spicy you want your rice. This again had a very nice “wok hay” and char and I could easily eat bowls of this rice! Overall, John 3:16 at the North Vancouver location did not disappoint. Once again, the flavours were on point and executed well. 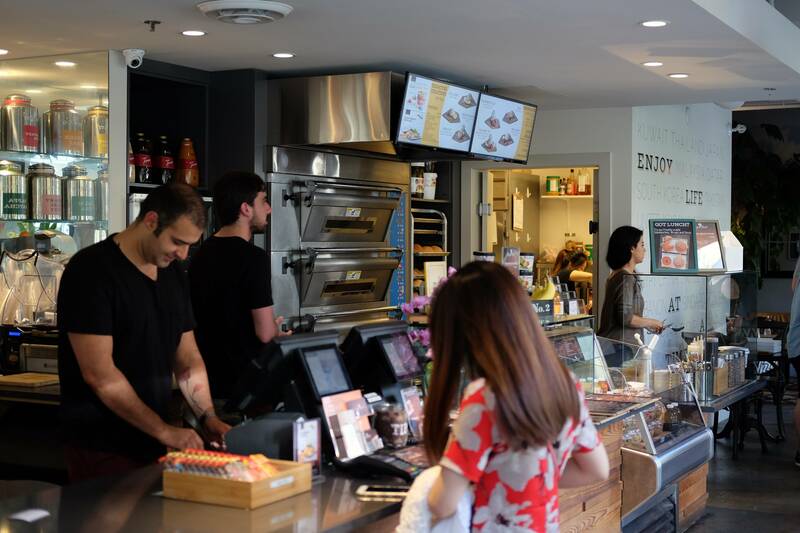 This location also is much bigger than their original location in Richmond. Downside is it’s quite far for me, so I will have to wait for the new Richmond location to open up! 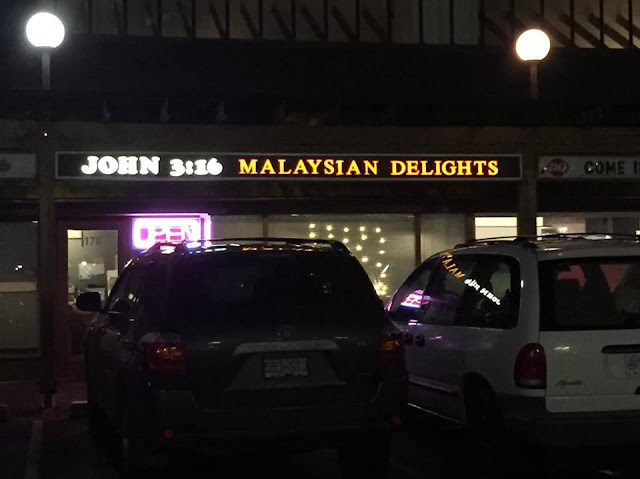 Seeing all the posts about John 3:16 Malaysian Delights and the restaurant being a drive away from my home, I suggested to S that we give it a try on Friday night for dinner. Situated in the strip mall on Buswell next to Dairy Queen, many would pass by not noticing this restaurant. The interior is very small and decor is quite shabby to be honest. Tacky wallpaper with religious quotes, so definitely not the greatest ambiance. Although the ambiance may be poor, the food here is of great quality. 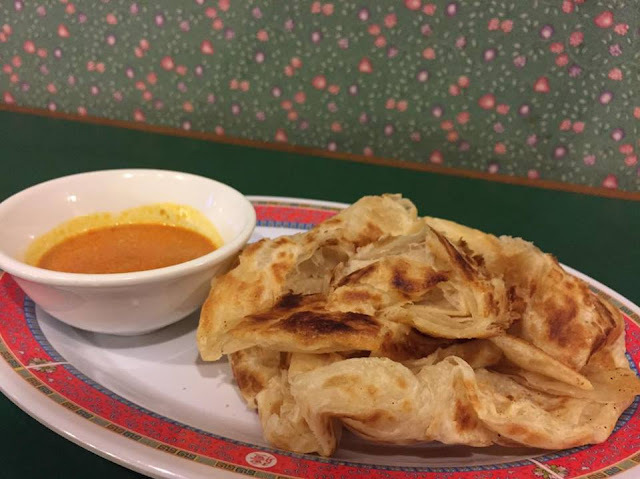 We started off with the Roti Canai with Curry Sauce which I had heard great things about. It didn’t disappoint as the roti was extremely flaky and buttery. I just wished there was more curry sauce for the two large pieces of roti! S got the Penang Char Koay Teow and this was amazing! 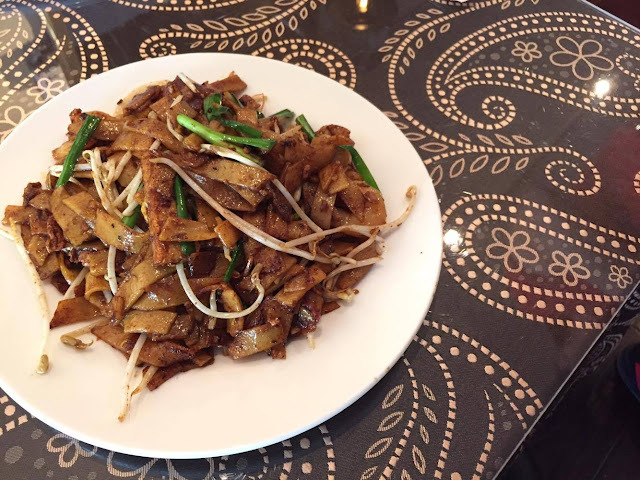 The flat rice noodles were stir fried with shrimp, egg, bean sprouts, Chinese sausage, and fish cake. The flavours were amazing and had that nice “wok” flavour. Very comparable to the ones in Singapore! For myself, I chose the Hainanese Chicken Rice. This came with a large portion of flavoured rice, but we still found that the flavours lacked compared to the ones in Singapore. As for the chicken, it was extremely tender and I liked the touch of the fried garlic on top. 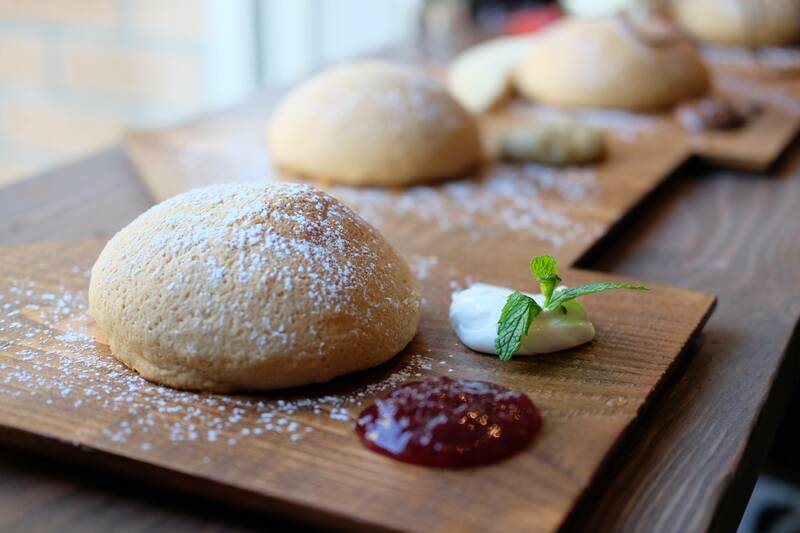 Overall, we were very pleased with the quality and flavours of the dishes at this hidden gem. Prices are also very reasonable with most of their entrees around $9. 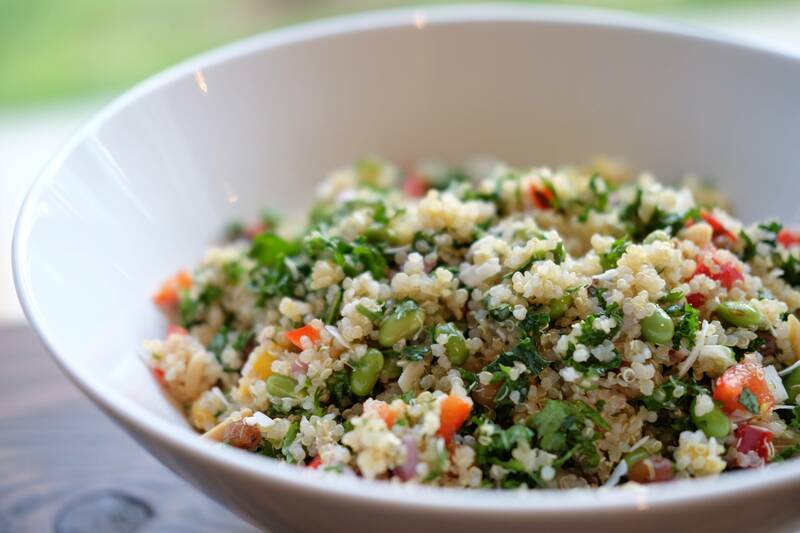 Good for sharing or if you want the whole dish for yourself. Only downside is the poor ambiance and how small the restaurant is. Service is friendly but slightly hard to get attention of since there is really only one girl running the front of the restaurant. They also only take credit card for bills over $30. Day 4 in Singapore started of with breakfast at the Mayflower Market & Food Centre. As we had moved back to the aunt’s place, we were in the Ang Mo Kio district. This is a residential area so the food centre is filled with locals. The great thing about eating at the hawker centres is that everyone can choose what they want and eat together. 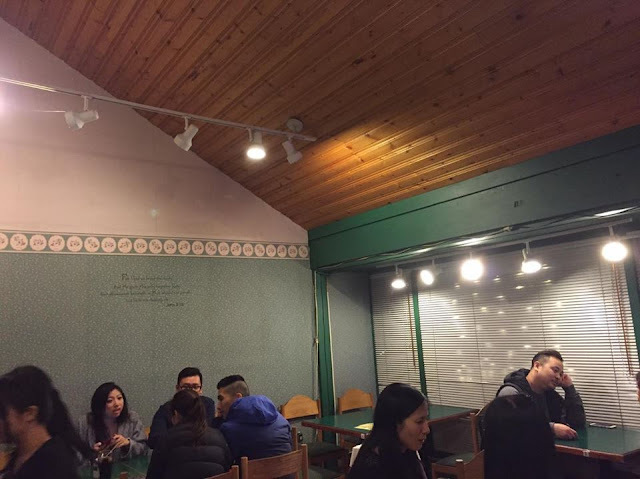 S chose to order from Jin Song which offers a variety of noodle dishes. He got the Wonton Char Sew Mee, which is really barbecued pork on top of wonton noodles. It comes with a side of wontons with soup in it and you can dip your noodles or pour the soup onto your noodles. Quite tasty and only around $2 SG. I got the Laksa which was for a cheap price of $2.50 SG and filled me up. You will find that each stall’s laksa broth is quite different. This one was strong in seafood flavours with ingredients like cockles being prominent in the flavour. It was also topped with various fish cakes. I got a grass iced grass jelly tea as my drink.Yum! After breakfast, S’s aunt drove us to the Singapore Zoo. As you can tell, we were driven around quite a lot on our trip, but getting around by public transit in Singapore is very easy too. Check the zoo’s website for easy directions for public transit. The admission fee for adults if you purchase at the booth is $32. It’s cheaper online or if you purchase with their self-serve kiosks at the front. You can save around 10-30%. The cool thing about the zoo is that it has an open concept exhibit where you can get pretty close to the animals. You’ll find monkeys just jumping around which is pretty cool. I also loved the shows that they put on, such as this elephant show. Be sure to scan the schedule and plan out the shows you want to see. The park is huge and offered a variety of exhibits. You can really see animals from all over the world including these cute koala bears! My favourite had got to be the polar bear exhibit! Watch the feeding show and you can watch him swim and catch his fish. I’d also highly recommend purchasing the tram ride which is $5 SG for adults which includes unlimited rides. It’s great when your feet is getting tired and the tram will take you to different zones where you can get off and continue by foot to see the animals in more detail. The Singapore Zoo itself can take you pretty much the whole day to see if you want to walk around casually. We weren’t in Singapore for long though, so we decided to check out the River Safari the same day as well. This costs $28 but I believe it’s cheaper when you buy a package which gives you access to both the Singapore Zoo and River Safari. However, we found this to be huge disappointment… This showcases many marine life animals, but we found the exhibition to be very small and animals underwhelming. We also paid an additional $5 SG for the Amazon River Quest Boat Ride. This was really just a log ride that allows you to view various animals along the way. However, many animals were sleeping and it was difficult to take pictures of them while the boat was moving. Would skip this in my opinion. The best part of the River Safari was probably the Giant Panda exhibit. Inside, you can find the red panda. So cute! You will also find the two giant pandas, Kai Kai and Jia Jia. Super cute but hopefully you catch them when they’re not napping! After the zoo, S’s aunts picked us up and told us we would be going to Malaysia for dinner. Apparently you can drive to Johor Bahru (also known as JB), one of the closest cities in Malaysia to Singapore. It is less than an hour drive and similar to how we visit Bellingham from Vancouver. You just need to go through customs which is a pretty fast process. We went to KSL City Mall as the aunts wanted to do some grocery shopping and we visited Taste Better. 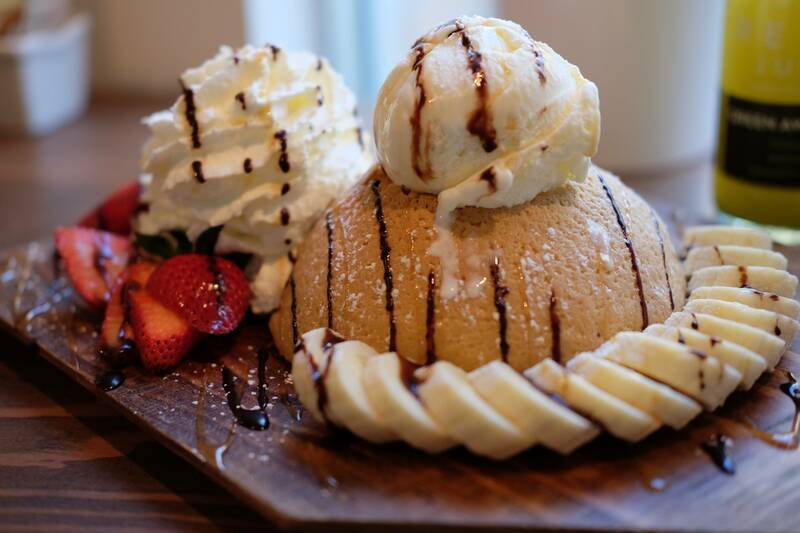 They are famous for their one-bite durian puffs. You have to eat them in one-bite because the durian cream inside will explode if you don’t! So good! Even though I’m not a fan of durian, these are delicious! After grocery shopping, we drove to Restoran Chua Kee which is famous for their seafood. S and I really wanted to eat crab, so the aunts suggested this spot. It is open concept so you sit in beach chairs. It was relatively clean in my opinion, but just leave your favourite dress behind if you’re visiting here. At the grocery store, we had purchased a peeled coconut. This is super cool! They peel the whole coconut so you’re left with all the pulp and juice inside! Only downside is the coconut wasn’t super soft. S got this Kickapoo Joy Juice Soda which apparently is American, but highly distributed in Singapore and Malaysia. It tasted like mountain dew. We started off with a fried fish and seafood dish. Not bad. This was fried butter coated chicken. 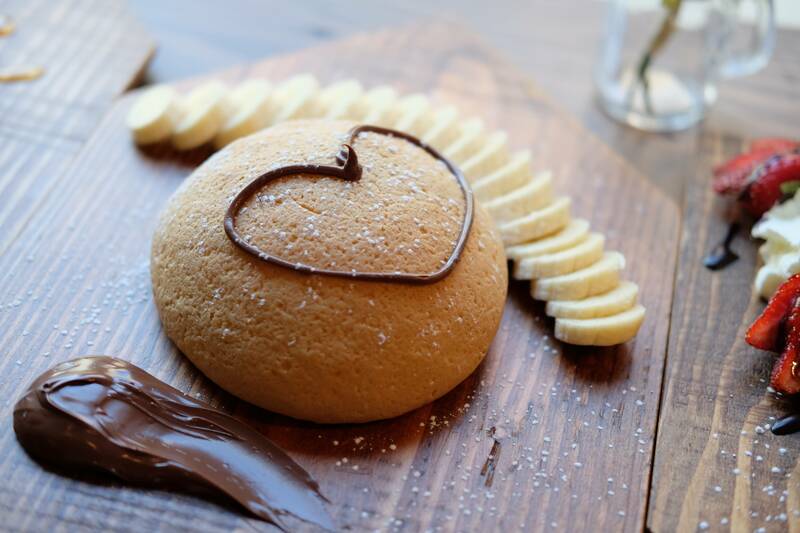 A bit sweet and and very tasty! Some veggies with chili. Fresh and loved the kick of heat. We also shared a bowl of shark fin soup. We also had this large seafood bowl which consisted of mussels, prawns, and cockles. It had a generous amount of this thick sauce which I wasn’t too fond of. As for crab, we started off with the salted egg yolk crab. We loved the coating and this is by far one of my favourite salted egg yolk crab. However, I found that the crabs in Malaysia to have rather small legs compared to the ones in BC. Only the claws had lots of meat. We also got the famous Black Pepper Crab. This was so delicious! But at the same time it is very spicy, so be warned. I wanted to keep eating it but it was really too spicy for me. After dinner, we crossed customs again and headed back to Singapore. Customs again was very quick compared to the one we have at Peace Arch. Who knew our trip to Singapore would take us to Malaysia as well! A fun trip to take if you have some spare time in Singapore. I think I’ve been to Coco Hut a long time ago, but it’s been years since. Since S is Singaporean, we decided to check it out and see whether it was up to par. The restaurant is rather small, but it was quite packed during dinner. Service is average as there is basically one women taking orders and serving the dishes. We decided to get the Meal for Two Combo which is priced at $20.95. 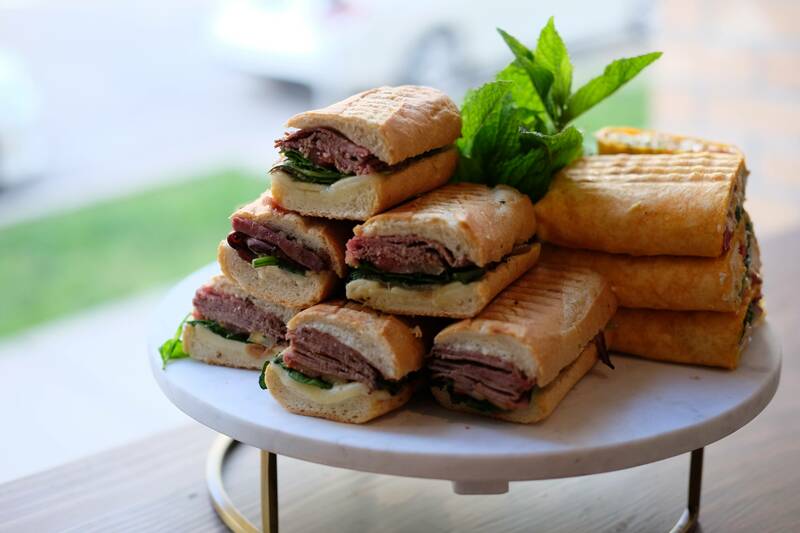 You get two drinks, an appetizer, and two entrees. We both added $0.50 extra to make our beverages cold. I got the Pearl Barley Tea, which has a slight barley flavour which tasted quite refreshing. S said that he has had much better though. Lemon Tea was quite your typical. For our appetizer, we got the BBQ Satay Skewers. You can choose from chicken, pork, or beef. We went for chicken and you actually get 4 skewers. I think the menu said only 2 skewers, so I was quite surprised. It comes with some peanut satay sauce with chopped up peanuts in it. The chicken had a nice char, but I didn’t find them to be mind blowing. S got the Hainanese Chicken with Flavour Rice. I hear that they are famous for them, but S said he was extremely disappointed. Mainly because the rice was not flavoured as he expected. It had only a very slight flavour, and he said this was not even close to being comparable to the ones in Singapore or at home. I found the chicken to be decent, with a nice jelly on the skin. I guess S is the expert with the chicken, since he’s had lots of it. He claimed it was very sub par. 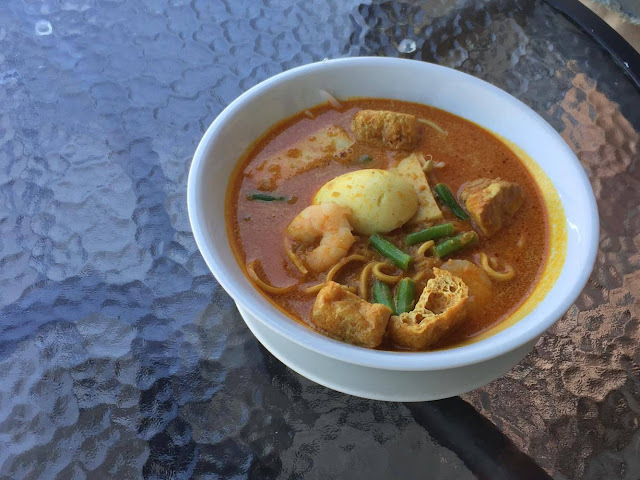 For myself, I got the Laksa Noodle in Soup, which was a huge bowl. It was filled with seafood, bean sprouts, and even some chicken. The soup was spicy, but definitely one that I could handle. I sort of wished it had more spice actually. Overall, I thought Coco Hut was decent, but S really didn’t enjoy it. I guess if you’re not an expert in Singaporean cuisine and you don’t eat it too often, then you’ll find Coco Hut to be pretty decent. Prices were decent for two and there is decent parking at this mall. I’ve been trying to give Kari House a try for the longest time. Unfortunately, they only open for very short periods of time. Every time I’m at Steveston village, they’re closed! They don’t open on Mondays, and only for a few hours for lunch and dinner the other days. Finally, I suggested to go here with J for lunch the other day. It’s family operated, and during a Friday lunch hour, it was almost fully occupied. Although they are famous for their good valued lunches, we opted to go with the normal dinner menu since we could share the larger portions. 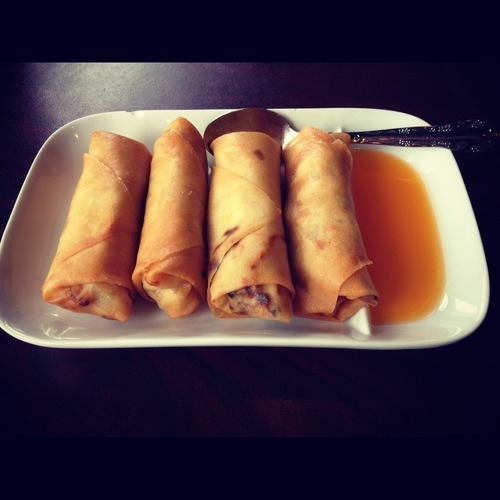 First up, we got the Spring Rolls, which were vegetarian. I didn’t find these that tasty. There was too much wrapping paper so when it was folded over and over again, it became really thick. Only the outside was fried crispy, but the inside layers were soft. 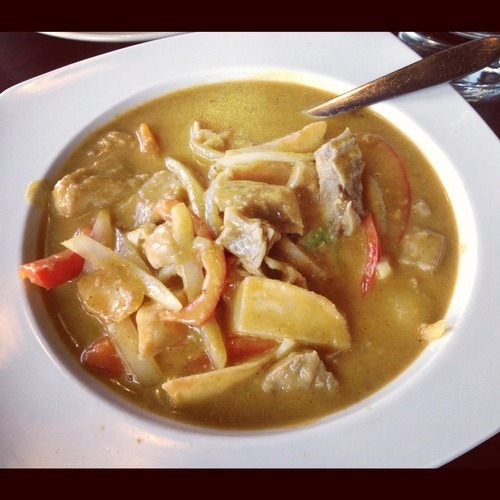 Whenever I think of Malaysian food, I think of curry and roti! I love roti, but these weren’t that great. 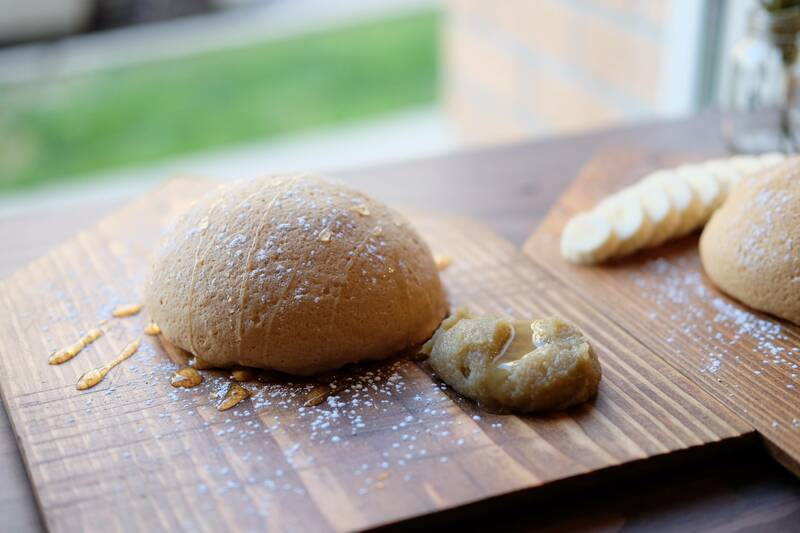 Blotches of the roti were quite burnt, and it was one large piece ripped into two, unevenly. I also thought the curry sauce that came with it wasn’t that great. I found it too watery. I was kind of disappointed with this. I think these were my favourite of the meal. 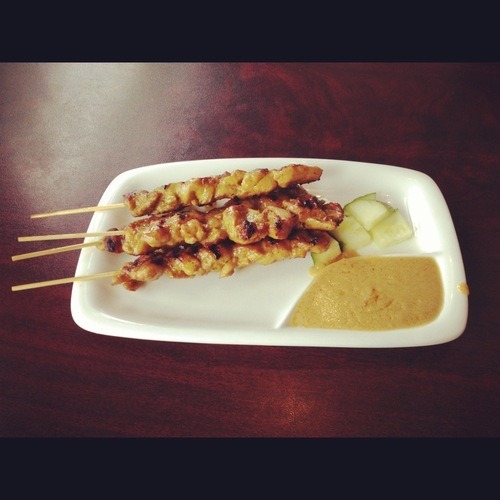 The Satay Ayam was served still hot and the chicken was super tender. It just ripped off the skewers. It was flavourful, and was perfect when accompanied with the peanut sauce. I found it not as tasty when I had my second one when it chilled though. Got to eat these skewers hot! Our last dish was the Kari Rendang. 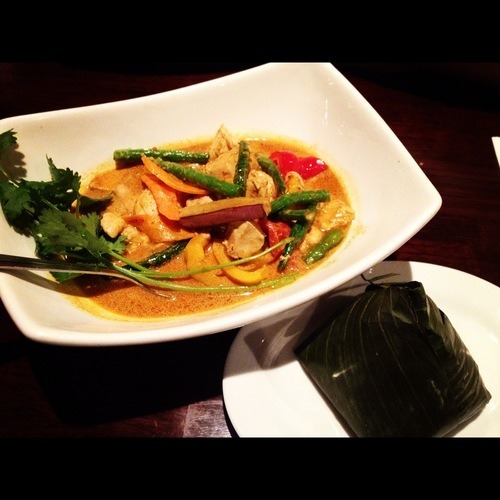 We knew we wanted some sort of curry, but we had no idea what to get. Decisions…! We ended up getting the Rendang because it said traditional curry… It was actually smaller than I had expected. But I guess paying a price of around $11, that was decent. I found this a little watery again. It wasn’t as thick as I would’ve liked. The beef brisket that we chose was quite tender though. We also got some rice to go with our Kari Rendang. It was actually a decent amount to share between the two of us. 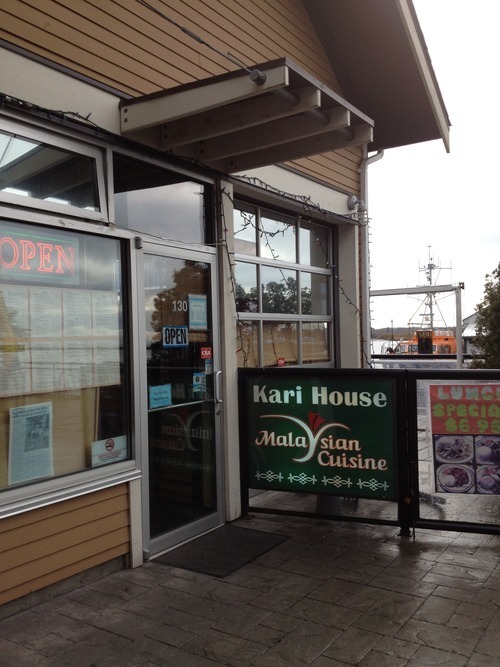 Overall, Kari House was decent, but I had expected much more because of the reviews. I’m not sure if it’s because I ordered the wrong dishes, but I had much higher hopes. It’s still not bad for their prices, and I would like to give it another try if I’m around the area again (and if it’s open!). I still prefer places like Tropica…sadly… even though I know it’s not authentic Malaysian food at all. But it works for my taste buds! 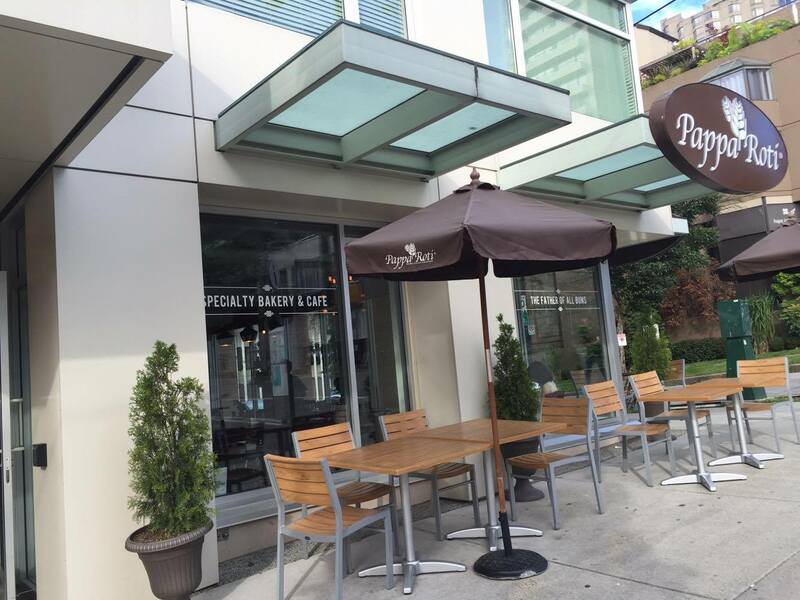 After hitting up Bella Gelateria, we went on Davie Street, since I wanted to try Thai Basil. Sadly, it was going to close in about an hour or so, and the seating was very limited. So off we went to explore what food there was to eat on Davie. And there was a lot! Such a busy street. 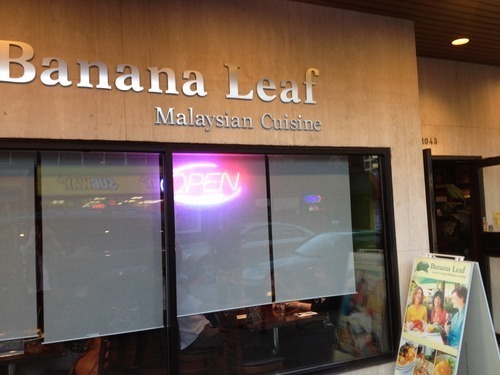 We ended up at Banana Leaf, since it was still sort of Thai/ Malaysian – well it’s supposed to be Malaysian, but close enough. It was actually already pretty late for dinner time, but the place was still quite full. It’s dim inside, and you get a pretty Malaysian feel to it. I got the Singapore Laska, which was actually quite delicious. I’m always kind of unsure about places that seem pretty westernized, just because I feel like the food may not be as authentic and probably just catered for the Canadians. 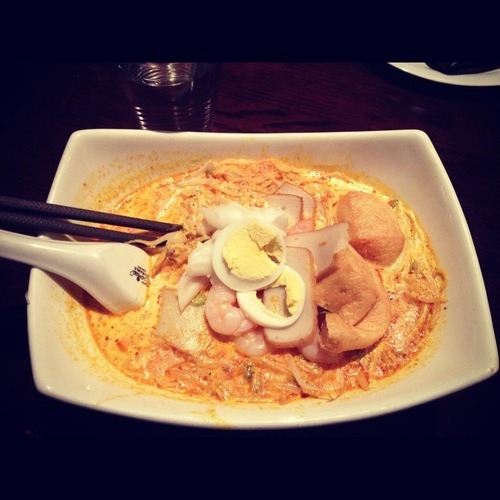 But the laska was actually quite comparable to many of the laskas I have tried at other Asian restaurants. I loved the tofu puffs and fish-cake, and there was a large abundance of ingredients. The soup was really nice with a hint of coconut flavour, and wasn’t so spicy that I couldn’t eat it. Good food and service! I believe it’s a chain restaurant, so there are a few more around Vancouver.